If your family is like mine, storage space in the house is prized real estate. You don’t want to spend the money on a storage unit, but you need somewhere to keep all the stuff your family collects. The perfect answer lies just outside your door. Your garage. If you optimize the space in your garage, you will be surprised how much you can store in there. Depending on where you live, however, the temperature range in your garage may prevent you from keeping some items in there. The main enemies of items in storage are moisture, sunlight, and rodents. So you’ll need to protect against those factors as best you can. Let’s take a look at what items you can store in your garage. I’ll also share what I think shouldn’t be stored in your garage. What things can I store in my garage? Yes, you can store ammo in a garage. Keep it in a tightly sealed container and off the floor in case of high water. 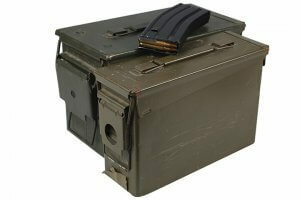 Ammo is susceptible to moisture and heat so try to limit those as much as possible. Nickel-Cadmium (Ni-Cad) batteries are fine to store in an unheated garage. As mentioned above, if you live in a very chilly climate, bring in your cordless tool’s lithium batteries or their lifespan will be reduced. If we are talking AAA batteries and stuff, find a drawer to keep them in inside. It’s much easier when you need new batteries for the remote. You can store a mattress in the garage, but there are a couple of things you need to do first. One, make sure the mattress is clean and dry. Then, encase it in a sealable mattress bag. Your best bet to help keep the mattresses shape would be to lay it flat. You don’t want it resting directly on the garage floor though. If you have the room, place some 2x4s width-wise down and set the mattress on top. If you don’t have the room to keep it flat, then on its side is your next best option. Don’t store it longways up as that could warp it. Why are you storing beer? Shouldn’t you be drinking it? I think it would be okay for a little while. And if you are in a perfect 72-degree climate it can probably be stored for years. Any high temperatures and I would say a few weeks at most. What you need to watch out for is sunlight. That will skunk your beer and make it taste bad. Another easy one. You can store bikes in your garage no problem. If you don’t ride very often I would hang them up on hooks like the ones shown below from Amazon, so their tires don’t warp after a prolonged sitting. You can store books, magazines, and other papers in a garage no problem. You do want to watch out for moisture, so keep them off the floor. I would use a sturdy plastic bin and lay the books flat. If you need to stand them up, make sure to pack them in tight, so they can’t fall over and warp. Make sure the container is tightly sealed so bugs and mice can’t get in. Yes, you can store Christmas decorations in your garage without any issues. Just be sure to wrap up the breakables in newspaper or bubble-wrap and place in a hard-exterior container like a plastic bin. The trick will be to get your fake Christmas tree back in the original box it came in! Clothes and blankets are fine to store in your garage. Make sure they are dry and put them in a tightly sealed plastic bin. Even better would be to put them in a vacuum sealer bags and then place in the bin. Coolers are perfect for the garage. Just make sure they are completely dry before putting them away. Otherwise, you’ll find a nasty mold growth the next time you go to use it. I don’t see a problem with it. I’m talking about the enclosed barrel type units. As long as you don’t put in the wrong ingredients that will attract bugs and pests it should be fine. Triple coupon day at the store, huh? Storing boxed diapers in your garage is fine. With the way babies go through diapers, I don’t think they will be in there long anyway. Keep them off the floor to minimize any insect or rodent damage. 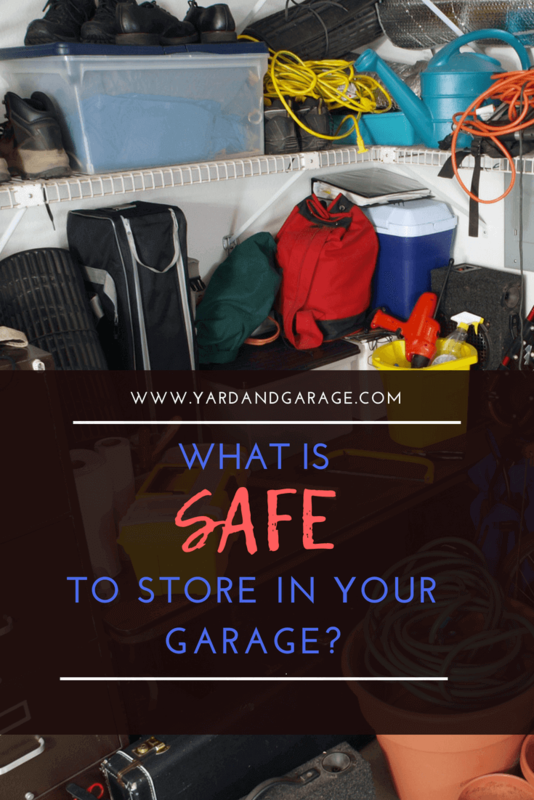 There are some varying opinions here, but I believe you can store electronics in your garage as long as you keep the items packed tight in a sealed bin and away from moisture. I collect retro computer equipment, and I have old computers that have been in a hot garage for years. The capacitors on those old machines leak even if they are in a climate controlled museum, so no big deal there. Now, this is for electronics that aren’t turned on. I wouldn’t put a working server rack out in my garage. You can store firewood in your garage, but it isn’t the best option. Look it over before you bring it in and make sure there are no bugs in it. I would place it a few inches from an exterior wall and keep it nicely stacked. Having an unkempt pile of wood in your garage is just inviting critters to live in it, so keep it tidy. A better choice would be to put it on some 2x4s, so it is off the ground and lay a tarp over it. Lay a movers pad over wooden furniture before storing it in your garage. This padding will protect it from dings and nicks. For couches and other fabric-covered furniture, I would make sure to clean it thoroughly first. Then, let it completely dry and then wrap it with adhesive wrap. You don’t want any moisture getting in so keep these garage items up off the floor. You can store a small supply of gasoline in your garage *if* you don’t have a water heater in there as well. High temperatures can cause the gas to expand and pop the top off. This leakage allows fumes to spread around and could get to the pilot light of the heater. If you do keep gas in the garage, make sure the lid is tight. Keep it away from sunlight. I would also suggest having it near the garage door to help with ventilation. 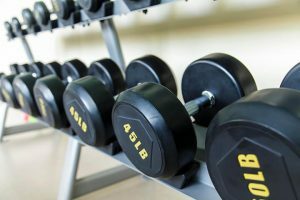 Yes, keeping your gym equipment in the garage is fine. The ideal spot would be a spare bedroom so you are more comfortable and more likely to actually use it. Keep a fan near the workout machines and crack the door in the summertime. Don’t get heatstroke. 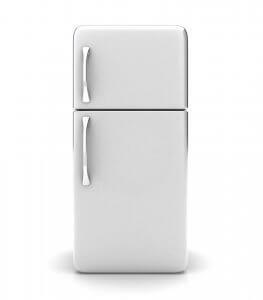 Like electronics, some people say you shouldn’t keep a refrigerator in your garage. I’m not from that school of thought. We bought a cheap smaller sized refrigerator for the garage that holds all of our drinks. It comes in handy for overflow food when we have large dinner gatherings as well. The nay-sayers will tell you that it will shorten the refrigerators lifespan and will cause your electricity bill to go up. These are probably both true but it is too convenient not to have one. Sports equipment can be stored in your garage. I use a large plastic bin to store soccer, tennis, volleyball, and basketball balls along with a hand-operated air pump. It’s helpful to keep like items together. That way it’s easier to find something when you go looking for it. Hockey families have it rough in this regard. Here is a post with an infographic that is about storing hockey equipment in your garage, I hope it is useful. No problem here. In fact, I’m sure Mom would prefer you didn’t track your muddy boots all over the house. One caveat for long-term storage of boots and shoes in the garage: spiders. I have found a black widow in a pair of grass-cutting shoes I left in the garage for a few months. Be sure to bang them out and open them up far enough to see if there are any webs/eggs. If you are squeamish about spiders, I suggest a tight-fitting container. Just be sure to let the boots dry before storing them. 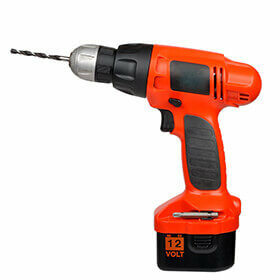 Tools are a no-brainer. A garage is where your tools are supposed to go. I use a rolling tool chest to keep all my screwdrivers, sockets and wrenches in. Nuts, bolts, and screws go in plastic drawers. For oversized items, I use hooks on a pegboard. I also keep all my power tools in their cases on metal shelves. If you are in a deep-freezing climate, you should take any lithium batteries in for the winter. What things shouldn’t I store in my garage? Heat will deteriorate your optical discs. I would not store them in a hot garage. I wouldn’t store canned goods in your garage unless it is 68 degrees year-round in there. Temperatures of 85+ can make it go bad quickly. We’ve all done it. You don’t want a messy paint can in the house, so you leave it in the garage. A few months/years/decades later you go to open it up, and there is a disgusting blob of gunk in there. Next time, keep the paint can clean and tuck it away in a closet or your basement. Don’t store cherished photographs in your garage for an extended period. Excessive heat will cause the pictures to stick together and tear up when separating them. Hmm, should I leave a pressurized flammable gas tank in my hot garage? I don’t think so. I would keep these on the patio near the grill in an attractive deck box (below is from Amazon).